Say cheese. Dairy products such as milk, cheese and yogurt contain calcium and phosphorus to build teeth and strengthen the supporting bone. And cheese neutralizes acid in the mouth to help fight cavities and gum disease. Choose lean proteins. Lean meats, poultry, fish, milk and eggs help strengthen teeth. They are rich in protein and phosphorous, which is essential for building strong bones and teeth. Eat a rainbow. Fruits and vegetables provide many key nutrients, including vitamins necessary for healing, bone strength, and healthy gums. Besides being nutritious, fruits and veggies scrub your teeth while you chew and stimulate the production of saliva, which is necessary for neutralizing acid and rebuilding enamel. Nibble on nuts. Nuts contain protein, fiber and healthy fats. They also contain essential vitamins and minerals to keep teeth strong and gums healthy. Further, chewing nuts stimulates saliva production, lowering the risk of tooth decay. Go for the grains. Studies have shown that eating too many refined carbohydrates such as white bread and sweet bakery items can lead to chronic inflammation, which is a factor in gum disease, heart disease, stroke and other conditions. In contrast, eating complex carbohydrates such as whole grains may reduce inflammation in the body. 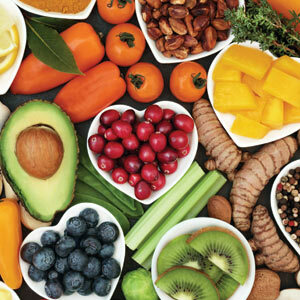 What you put in your body can play a big role in preventing tooth decay and gum disease, so choose foods that provide the right building blocks for optimal dental and overall health.